STARSHINE (Student Tracked Atmospheric Research Satellite for Heuristic International Networking Equipment) was an educational microsatellite, built and launched to encourage optical tracking and satellite observation by students. 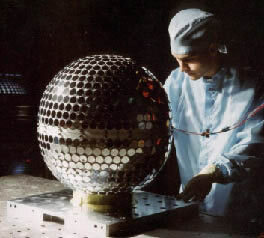 STARSHINE was a passive, polished 48-centimeter-diameter hollow aluminum sphere, manufactured by the United States Naval Academy and covered by 878 25-millimeter-diameter mirrors that were ground at many participating American and international schools. Deployed from a hitchhiker slot on the Shuttle, STARSHINE was visible from the ground with the naked eye, flashing every few seconds due to its spin. It decayed on February 18, 2000.